Wachesaw Plantation East is a lowcountry course, located just minutes away from Myrtle Beach in Murrells Inlet, South Carolina. Clyde Johnston, as golf course architect, built the championship course with a Scottish flair by incorporating freshwater lakes lining the greens. The natural landscape with densely packed oaks and undulated greens makes Wachesaw Plantation East an enjoyable course for all golfers. The course has been televised with the LPGA and Kathy Ireland/Greens Competition Classic. As an award winning top ranking golf course in Myrtle Beach, Wachesaw also received Golf Digest’s 4.5 star rating. 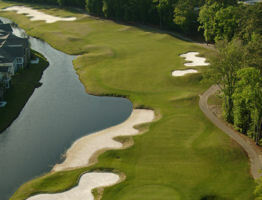 Myrtle Beach golf courses are plentiful, but Wachesaw East is unquestionably one not to be missed! The course is par-72 and playable for all skill levels, with a traditional layout of four par 5’s, four par 3’s and ten par 4’s. Beginner golfers, beware! The winding narrow stream that crosses directly in front of the putting green may pose a potential threat. Wachesaw Plantation East is an exciting course to play; and a perfect addition to all golf trips. After golfing, relax in the classic clubhouse or visit the pro shop to purchase a Wachesaw Plantation East logo souvenir. When hunger strikes, golfers can grab a quick bite to eat at the grill, which overlooks the practice area. Wachesaw Plantation East offers many year-round golf discounts to both locals and visitors. Outstanding Myrtle Beach courses are at your fingertips. Understanding that making golfing affordable is essential to any golfer’s budget, consider booking a golf vacation package then next time you plan on golf in Myrtle Beach. Packages often include accommodations at a top-notch Myrtle Beach golf resort and even discounted tee times. Plan early and save a lot on Myrtle Beach golf! We come here 2-3 times per year and love it every time! Gorgeous golf course my top 5 on the grand strand! This entire plantation is filled with history and a southern unique charm rarely seen... after visiting the neighborhood, we decided to move in! We love it this is world class!! One of the best golf tracks on the Strand, private club, lovely grille..
Had a great dinner at Kimballs. ... beautiful view on the river. Good food! Great course. Too bad its private. Nice greens, excellent fairways. I got to see first hand the beauty of Wachesaw Plantation when I traveled to Murrell's Inlet on November 3rd for one of my clients. I had actually traveled up there in June to check out the venue and had met with Brayer to begin discussing the details, and to see where I would be set up logistically. Then, all of a sudden, it was November and time to head back. It was the perfect Lowcountry weekend for a fall wedding, so crisp and cool. The venue backs up to the Waccamaw River and provides a great outdoor ambiance for both the wedding ceremony and reception. I wanted to thank Brayer and her staff for being so professional and hospitable. This was a rare occasion where I traveled from my home market of Charleston for one of my clients and it was nice to be greeted with professional staff at a wedding venue. Very nice golf course. Front 9, everything is right in front of you. Make the turn and you're playing all kinds of target golf on some beautiful, interesting, and entertaining holes. Great conditions, challenging yet fair. We were visiting and playing the course for the first time. We let 2 groups of members play through and they were friendly and appreciative. Most of the staff were professional, helpful and friendly. This is for the private club - there are two courses. I was with 7 other golfers from Virginia Beach. We came down on a Thursday and teed of at 1:30, 1:40. On the 13th green the lady PGA pro drove up in a cart unannounced and awaited at the green we were putting at and stood there without saying a word. As we walked off she told us we were 3 holes behind the next group, (not correct by the way) and we had to skip a hole. This was the only time we saw anyone from the course and after paying $80 to have to skip a hole when we were on pace for this tract was ridiculous. Later when confronted at the pro shop we asked how fast we should play this course and her response was, "4 hours". There is no way to play this course that is unfamiliar in 4 hours. At the time we were interrupted and treated horribly and insulted by this PGA official, it was 4:35. Her reasoning for telling us to skip a hole was "some members were complaining"
Wonderful golf experience! Staff extremely friendly. Course in great shape. Wide open fairways, fast greens but true roll. Hope to play again!! I went to the tennis club. People are super friendly and the location is beautiful and courts in great condition. Wachesaw Plantation East is a lowcountry course, located just minutes away from Myrtle Beach in Murrells Inlet, South Carolina.